For other people named William Powell, see William Powell (disambiguation). William Horatio Powell (July 29, 1892 – March 5, 1984) was an American actor. A major star at Metro-Goldwyn-Mayer, he was paired with Myrna Loy in 14 films, including the popular Thin Man series based on the Nick and Nora Charles characters created by Dashiell Hammett. Powell was nominated for the Academy Award for Best Actor three times: for The Thin Man (1934), My Man Godfrey (1936), and Life with Father (1947). An only child, Powell was born in Pittsburgh, Pennsylvania, the son of Nettie Manila (née Brady) and Horatio Warren Powell, on July 29, 1892. His father was born in West Middlesex, Pennsylvania (where Powell spent his boyhood summers), to William S. and Harriet Powell. Powell showed an early aptitude for performing. In 1907, he moved with his family to Kansas City, Missouri, where he graduated from Central High School in 1910. 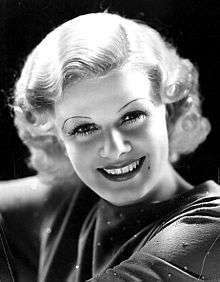 The Powells lived just a few blocks away from the Carpenters, whose daughter Harlean also went to Hollywood, under the name Jean Harlow, although Powell and she did not meet until both were established actors. After high school, he left home for New York and the American Academy of Dramatic Arts at the age of 18. In 1912, Powell graduated from the AADA, and worked in some vaudeville and stock companies. After several successful experiences on the Broadway stage, he began his Hollywood career in 1922, playing a small role as an evil henchman of Professor Moriarty in a production of Sherlock Holmes with John Barrymore. His most memorable role in silent movies was as a bitter film director opposite Emil Jannings' Academy Award-winning performance as a fallen general in The Last Command (1928), which led to Powell's first starring role as amateur detective Philo Vance in The Canary Murder Case (1929). Powell's most famous role was that of Nick Charles in six Thin Man films, beginning with The Thin Man in 1934, based upon Dashiell Hammett's novel. The role provided a perfect opportunity for Powell, with his resonant speaking voice, to showcase his sophisticated charm and witty sense of humor, and he received his first Academy Award nomination for The Thin Man. Myrna Loy played his wife, Nora, in each of the Thin Man films. Their on-screen partnership, beginning alongside Clark Gable in 1934 with Manhattan Melodrama, was one of Hollywood's most prolific, and they appeared in 14 films together. Loy and he also starred in the Best Picture of 1936, The Great Ziegfeld, with Powell in the title role and Loy as Ziegfeld's wife Billie Burke. That same year, he also received his second Academy Award nomination, for the comedy My Man Godfrey. In 1935, he starred with Jean Harlow in Reckless. A serious romance developed between them, and in 1936, they were reunited on screen and with Loy and Spencer Tracy in the screwball comedy Libeled Lady. Harlow died from uremia at the age of 26 in June 1937 before they could marry. His distress over her death, as well as a cancer diagnosis, caused him to accept fewer acting roles. Powell's career slowed considerably in the 1940s, although he received his third Academy Award nomination in 1947 for his role as the cantankerous Clarence Day, Sr., in Life with Father. His last film was 1955's Mister Roberts with Henry Fonda, James Cagney, and Jack Lemmon. In 1915, he married Eileen Wilson (1894–1942) who was born Julia Tierney, with whom he had his only child, William David Powell, before an amicable divorce in 1930. Powell's son became a television writer and producer before a period of ill health led to his suicide in 1968. 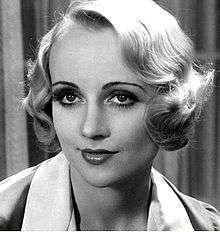 On June 26, 1931, Powell married actress Carole Lombard. The marriage lasted just over two years. They were divorced in 1933, though they, too, remained on good terms, even starring together in the screwball comedy My Man Godfrey three years later. Powell was devastated when he learned of her death in 1942. In 1937, Powell was diagnosed with cancer. He underwent surgery and experimental radium treatment which put the disease in full remission within two years. Given his own health and sorrow over Harlow's death, Powell did not undertake any film roles for over a year during this period. Three weeks after they met, on January 6, 1940, Powell married actress Diana Lewis, whom he called "Mousie". They remained married for 44 years, residing primarily in Palm Springs, California, until Powell died at the age of 91. Powell died in Palm Springs, California, on March 5, 1984, at the age of 91, some 30 years after his retirement. He is buried at the Desert Memorial Park in Cathedral City, California, near his son William David Powell and wife Diana Lewis. New York Film Critics Circle Award for Best Actor in 1947 for Life with Father and The Senator Was Indiscreet. William Powell has a star on the Hollywood Walk of Fame at 1636 Vine Street. In 1957, Powell was awarded The George Eastman Award, given by George Eastman House for distinguished contribution to the art of film. In 1978, influential proto-punk band The Dictators recorded a well-reviewed rock ballad, "Sleepin' with the TV on" in homage to William Powell and The Thin Man films. In 1992, a Golden Palm Star on the Palm Springs, California, Walk of Stars was dedicated to him. Television star and comedian Don Adams stated that his famous "clippy" Maxwell Smart voice characterization was an exaggeration of the speaking style of actor William Powell. ↑ Parish, James Robert, and Don E. Stanke (1975). The Debonairs. New Rochelle, N.Y: Arlington House. p. 459. ISBN 9780870002939. ↑ "Mousie", Find a grave . ↑ Brooks, Patricia; Brooks, Jonathan (2006). "Chapter 8: East L.A. and the Desert". Laid to Rest in California: a guide to the cemeteries and grave sites of the rich and famous. Guilford, CT: Globe Pequot Press. pp. 240–242. ISBN 978-0762741014. OCLC 70284362. ↑ Donald Greyfield (January 1, 2001). "William Powell". Actor. Find a Grave. 1 2 "Those Were the Days". Nostalgia Digest. 37 (1): 32. Winter 2011. ↑ "Radio Guide". Pennsylvania, Altoona. Altoona Tribune. August 16, 1949. p. 19. Retrieved November 14, 2015 – via Newspapers.com. Bryant, Roger. 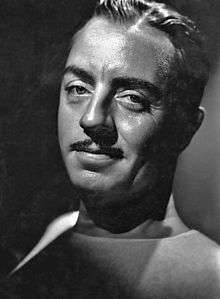 William Powell: The Life and Films. Jefferson, North Carolina: McFarland & Co., 2006. ISBN 0-7864-2602-0. Christensen, Lawrence O., et al. Dictionary of Missouri Biography. Columbia, Maryland: University of Missouri Press, 199. ISBN 0-8262-1222-0. Francisco, Charles. Gentleman: The William Powell Story . New York: St Martins Press, 1985. ISBN 0-312-32103-1. Wikimedia Commons has media related to William Powell.